Stone, with its infinity in terms of size, shape, colours and style, is an excellent form of coating for both inside and outside the house. Thanks to its strength, versatility and variety of uses, this material is a popular choice when it comes to decorating the house. There are also many different types of colours of stone, which can bring a beautiful rustic touch to a home, while contributing to a modern or minimalist design. To inspire you, we will show you eight photos of designs with stone, from top professionals from around the world. You'll want to integrate this natural material into your home immediately! For the garage area, there is nothing better than the durability of large, paving stones. Not only are they aesthetically-pleasing but they are resistant to the damage done over time. This type of flooring ensures that it will last a lifetime and it won't get damaged by dripping oil or the tyres of a car. It also keeps the design of the area looking uniform and unique. To create a good contrast between the dark grey of the cobblestone, you can create a little pebble garden with white stones and a beautiful green plant. This will break up the dark tones and create a beautiful, natural and rustic touch! 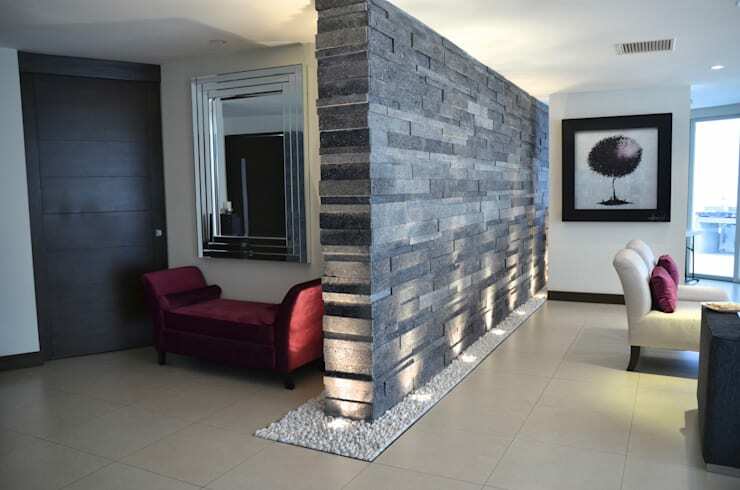 To incorporate a touch of identity into your house right from the get go, as you step through the front door, you can build a wall of lava stone slabs like the designers have done in this image. 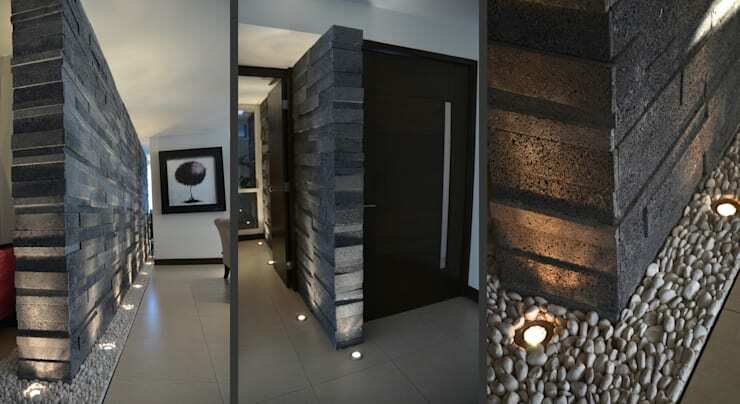 We can see how the different shades of grey bring a very elegant touch to the entrance. You can mount the stones on the surface of a wall or create a pure raw stone wall. We can also see how lighting has been used to enhance the details and design of the stone wall, creating a very interesting texture. To generate a sensory contrast with the aridity of lava stone, it is a good idea to choose a matte porcelain tile covering for the floors, bringing in a sense of warmth and cosiness to the interior design. This adds a smooth surface to the interior, creating an elegant look and feel that is also practical and easy to clean. The garage often features service access, which is very functional. 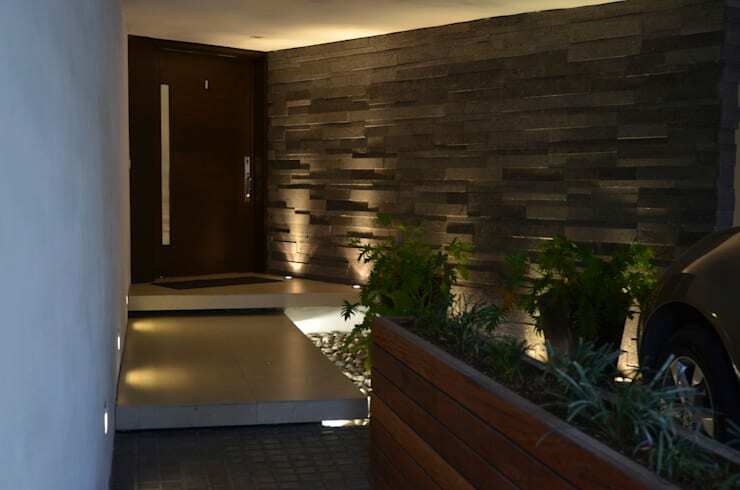 To cut up the grey tones and ensure the entrance very clearly stands out, these designers have used a very trendy and modern large wooden pot plant to break up the space. The door of the garage is made from the same material. 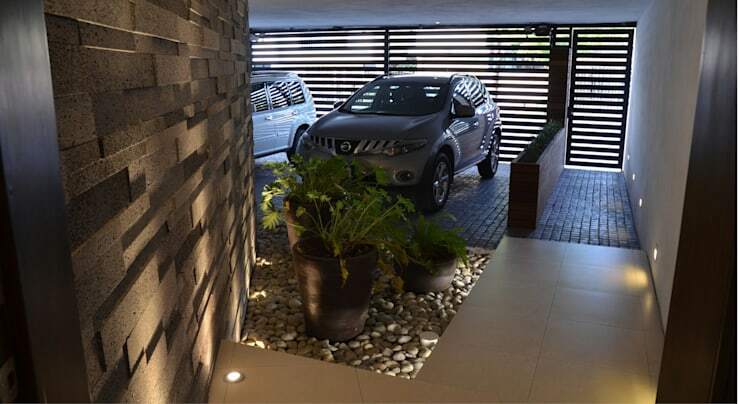 The garage door features horizontal strips, which allow natural light to flood through this space so that it isn't too dark or dingy. This area of the house is used for a desk as well as a television room. It is a very elegant space with decorative touches. This is a part of the home that usually sees guests, which is why it is so important that it is aesthetically-pleasing and comfortable at the same time. 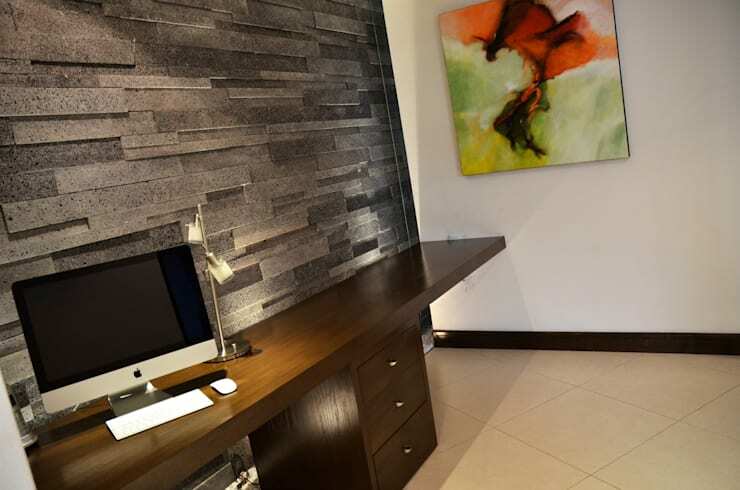 In the image, we can see how the elegant grey stone wall perfectly combines with the smoothness of the polished wooden desk. The dark tones on the wall are balanced out by the smooth, dark wooden desk and the soft, creamy tiled floors. The facade of the house is the first impression that guests will get of your home so you want it look beautiful. Who doesn't enjoy a good design? 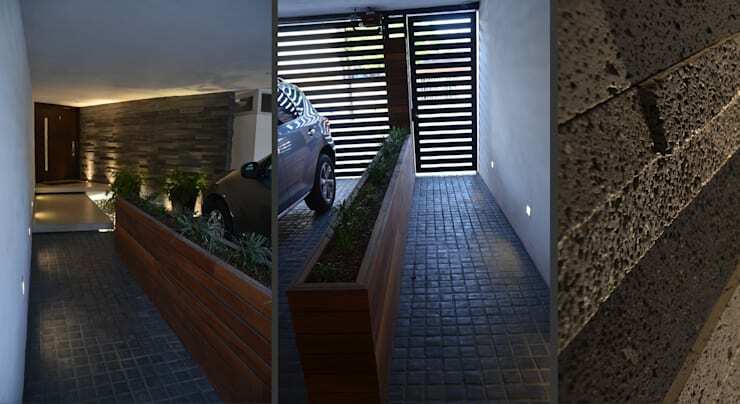 This can be achieved by strategically placing lights throughout the exterior space, highlighting the different volumes and details of a stone wall. The tones and textures of the facade will stand out that much more. In this image, we can also see how the stone wall contrasts beautifully with the white paving and the gorgeous, green plants. Have a look at these outdoor lighting ideas for modern houses for inspiration! 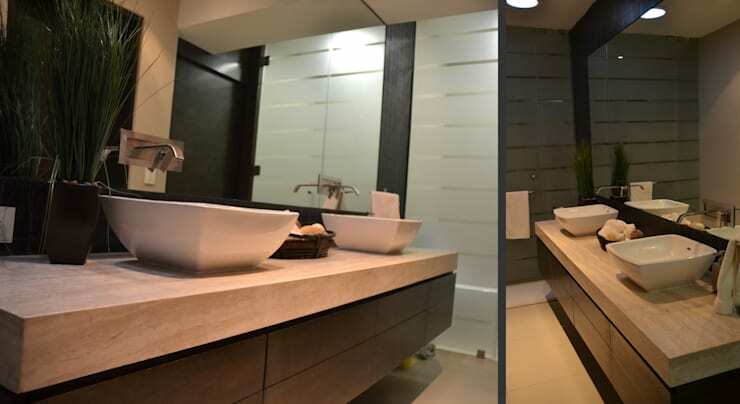 In this design, we can see how stone has been used in the form of marble for the bathroom counter. A polished stone was chosen in sand and pink tones, giving this room a very elegant and sophisticated design. The pink hues blend beautifully with the dark wood of the cabinet, under the counter. They are also emphasised by the large mirror that runs across the entire wall. 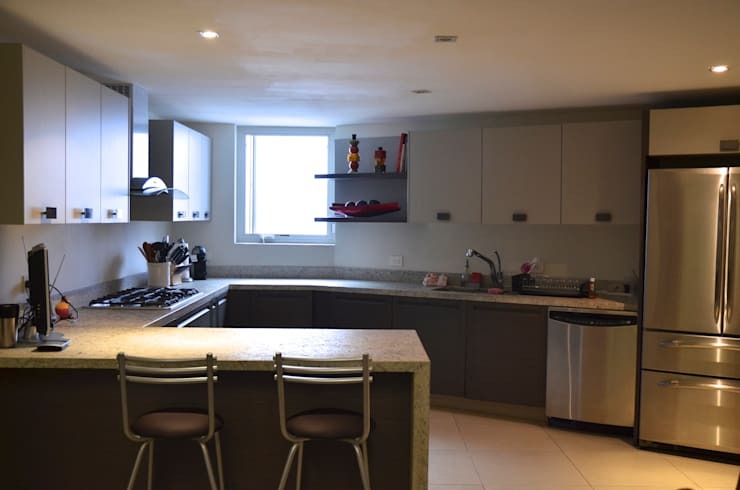 The kitchen can also take advantage of the properties of stone. In this image, we can see how granite works beautifully for this space as it doesn't get damaged easily and won't stain. The warm tones of the counter tops are replicated by the mosaic floor, which gives much more movement to the space. If you like the idea of stone in your home, have a look at: How you can make your home roar with raw materials. Would you use stone in your house?